Back in June, as part of my Yoga Teacher Training, I taught a yoga class that is hosted by area churches called Be Still and Know. Be Still and Know is a restorative yoga class that is both gentle movement and spiritual practice. 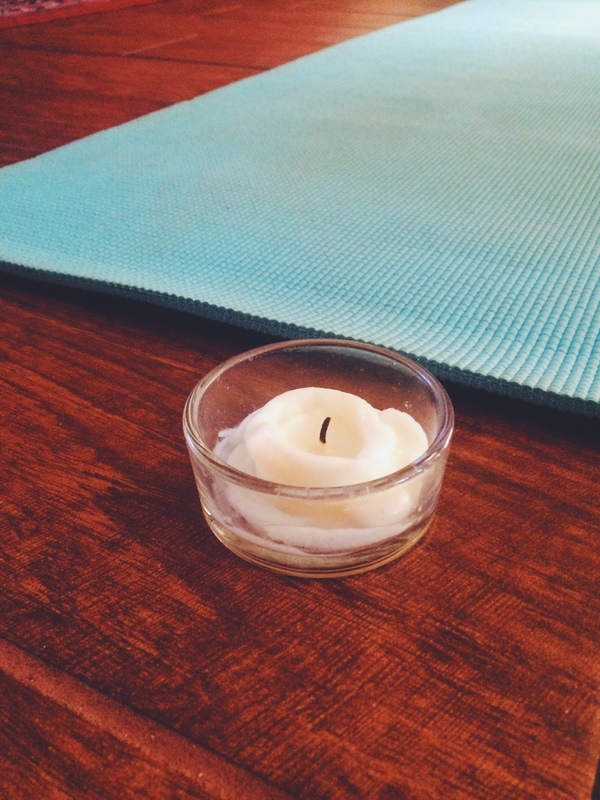 It’s a beautiful collection of the things I love most about yoga! 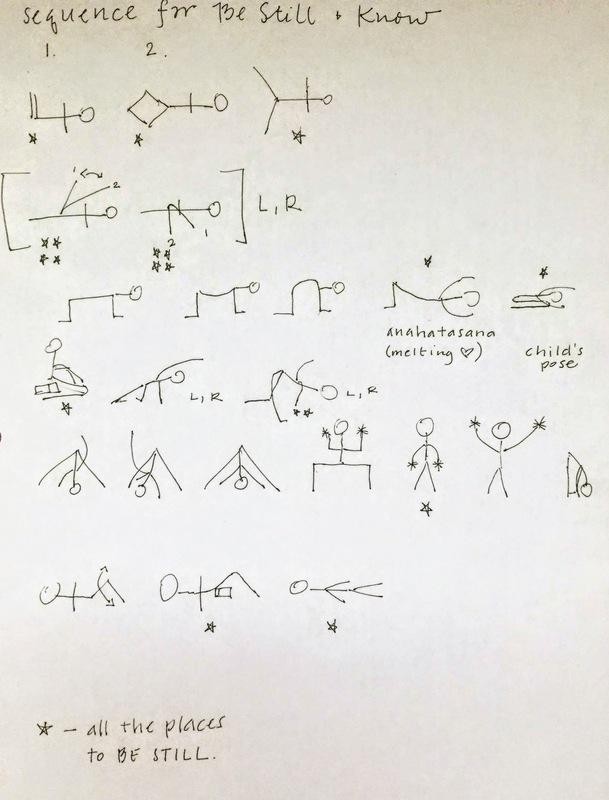 It was so fun for me to walk through the experience of putting this yoga class together, so I thought I would share the themes and my (very rough draft) sequence drawing that I used. The stars in the script are the break in the content where I added movement. To be still is to let go. When we are still, we release control. We can be present to this moment. Recently I read a story from Sue Monk Kidd’s book When the Heart Waits that has been helpful to me as I have sought stillness in my own life. One day after morning prayers, I walked to the edge of the pond and sat on the grass. I listened to the wind sigh over the water and tried to be still, to simply be there and wait in the moment. But almost instantly my inner chaos rose up. The need to keep moving, to act, to solve everything overpowered me. I got to my feet. As I returned to the guest quarters, I noticed a monk, ski cap pulled over his ears, sitting perfectly still beneath a tree. There was such reverence in his silhouette, such tranquil sturdiness, that I paused to watch. He was the picture of waiting. When you’re waiting, you’re not doing nothing. You’re doing the most important something there is. Stillness, along with solitude and silence, is a place of becoming. Of transformation. Our stillness, the undisturbed glass lake of our soul, is a place we can always come back to, like child’s pose. After the wind blows and waves rise on our lake, we can return again to stillness. The waves can subside. The wind can get quiet. We can be still again. Our bodies get still first, but then slowly we can also be still in our minds. Let go of what we need to do. Let go of what we didn’t get done today. On the days we wake up overwhelmed with all the things we have to do, when our minds are rushed with thoughts of everything that must be done, can we be still? a way to quietly, bravely rebel. we are courageously choosing not to conform to the ways of the world. Trusting that God will take care of us. He will not let the wave come crashing down on us. Or if He allows the waters to rise around us, He will also provide what we need. Oh Lord, I know you will not let me drown. And so I will be still. These are the silent assents we make when we choose stillness. Quiet brave declarations that we will choose stillness over hurry. May you have the courage to be still this week.